In 1993, when Oasis played King Tut’s in front of a handful of people, nobody could have predicted what was lying ahead. Yet, that night, it only took a hint of intuition and a couple of Jack Daniels for Alan McGee to sign one of the biggest bands of the last 30 years. In celebration, a signing was even organized at HMV prior to the concert, as a special treat for Scottish fans. It takes time for the impressive SSE Hydro to fill, and the audience is still quite sparsed when supporting band Black Rivers gets on stage. The performance is quite messy, blame it on a barely audible voice and bad sound settings marked by frequent cuts. If the audience gives a polite welcome to the English band, it is not difficult to see it is far from enough to fill the wait. At 9pm sharp, Noel Gallagher and his High Flying Birds finally take on stage to the sound of “Shoot A Hole Into The Sun” – a B-side from their debut album – while the back screen displays a wall of bricks soberly announcing the band. Hysteria takes over excitement, and as the wall cracks, the real deal begins. 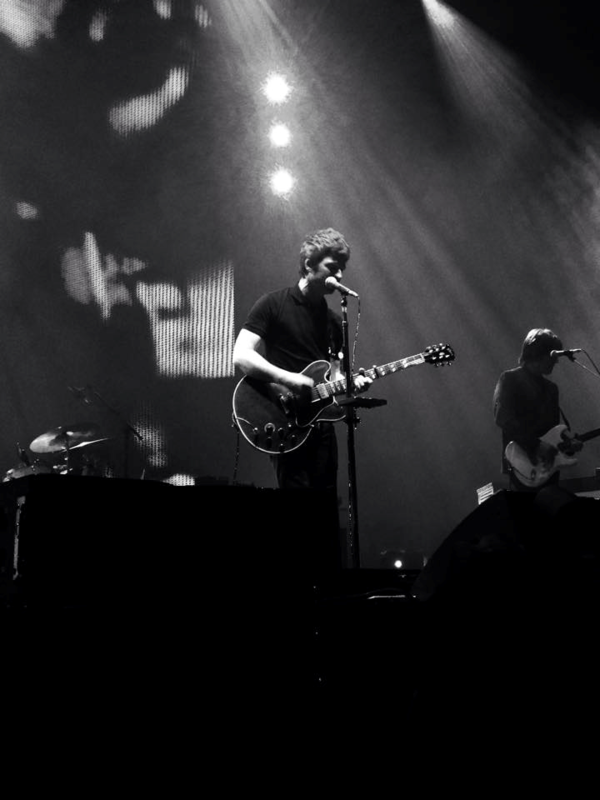 In a recent interview given to the NME, Noel Gallagher promised his setlists would be a perfect mix of his new tracks and Oasis’ classics (rearranged to his new sound) to please an audience that often comes out of a certain nostalgia (as proved by the number of Oasis t-shirts in the venue.) And the promise is kept, with five songs from the Definitely Maybe/(What’s The Story?) Morning Glory era. The set starts with “Do The Damage”, B-side from “Chasing Yesterday’s” first single “In The Heat of the Moment”, a perfect choice to energetically answer to the explosive atmosphere. The band carries on with two tracks from their first album (‘Stranding On The Wrong Beach’ and ‘Everybody’s On The Run’) accompanied by a choir. First Oasis’ song played is an acoustic rendition of‘ Fade Away’, and we must wait for the fifth song of the set to actually hear tracks from the new album (‘In The Heat of the Moment’, ‘Lock All the Doors’), with a special mention to the brass section that gives an epic dimension to the excellent ‘Riverman’ and ‘The Mexican’. We could say Noel was rather surprised and quite delighted with the audience singing along songs that were only released five days before. After admitting he “did feel a bit like Father Christmas” during the signing, the Chief moved on with some of the public favourites: ‘If I Had A Gun’, ‘Aka… Broken Arrow’ and ‘The Death of You and Me’. But it’s definitely with ‘Champagne Supernova’, ‘Digsy’s Dinner’ (dedicated to Kevin Bridges), ‘Don’t Look Back in Anger’ and ‘The Masterplan’ that the night reaches its apex. There truly is no word to describe the feeling coming from more than 10 000 people singing those classics altogether. Posted in Music and tagged concert, gallagher, gig, hyrdo, noel, oasis, sse. Bookmark the permalink.